Only 10 left in stock - Order today! Recognized throughout the world as the gold standard in wine cellars, the new Revelation Wine Cellar from EuroCave is just that… a Revelation. The illuminating cellar display UV free lighting will beautifully, yet safely, showcase your prized collection. The revolutionary self-closing shelving system ensures your bottles encounter the least amount of vibration possible while the added space between shelves will keep those precious labels intact. 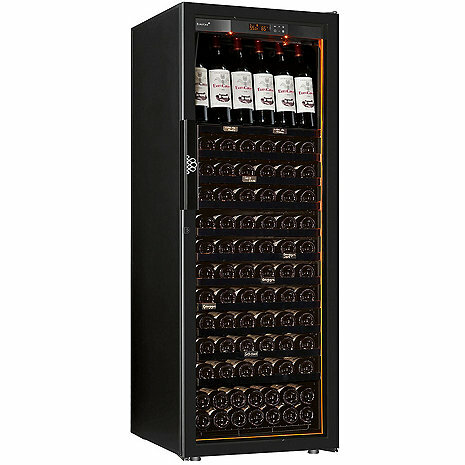 Boasting a full 5 year parts and labor warranty, an innovative new inventory labeling system as well as the highest energy efficiency rating of A+, the Revelation offers the true connoisseur wine storage in its highest and most luxurious form. EuroCave Revelation is the only wine cellar on the market that carries a FULL 5 Year Warranty covering Parts and Labor. With a guarantee like that you can rest assured that your prized collection will remain safe and properly protected for years to come. Sparkling presentation for your bottle, this is what the Revelation offers. A patented strip of light all around the cabinet bathes your bottles in a halo of amber which dramatically highlights the inside of the cabinet. UV-Free lighting to safely accentuate your bottles. Soft-Close device mounted on each sliding shelf, allows quiet and smooth handling. Vibration is one of the enemies of wine, the soft-close helps to keep vibrations to a minimum. Smooth Handling: By creating Revelation we wanted to offer a new generation interior layout, for improved ergonomics and ease to use. Sliding shelf with capacity for up to 12 bottles. Choose your front: the warmth of light oak or the moderninity of glossy black. Gross Shipping Weight Approx: 220 LBS. Here is our rule of thumb: If up to half of your collection consists of non-standard Bordeaux-size bottles, your maximum capacity may be reduced by 20-25%. If your collection consists mostly of these larger sized bottles, your maximum capacity may be reduced by as much as 40%. The one thing we do know is that all collections are different, and that's the great thing about collecting wine! If you have any questions regarding your collection and its effect on your capacity, call one of our Wine Storage Specialists at 800.377.3330 for a full consultation. Thu, May 2 - Mon, May 13. Is this unit feasible for bottle aging? The is for the quick reply. Can bottles be aged in this unit for an extended period of time? Like 10 years? I have not done that - but I do not see why not.